With the 2018 ForzaRC Pre-Season Invitational taking place this past weekend in Seattle, Washington – the home of Forza Motorsport developer Turn 10 Studios, we were fortunate enough to take a special guided tour of the building with the competing ForzaRC drivers and other invited media. This all begun with a look at the studio’s lobby, which features lifelike shells of the McLaren P1 and the Porsche 919 Hybrid race car, as well as Alan Hartman’s very own 2017 Ford GT. The tour allowed us to explore Turn 10 Studios, including their famous awards cabinet and dedicated sim rigs for Forza Motorsport 7. There was also a roundtable discussion with the team behind the game, as well as a ForzaRC Pre-Seasonal Invitational cake to enjoy. 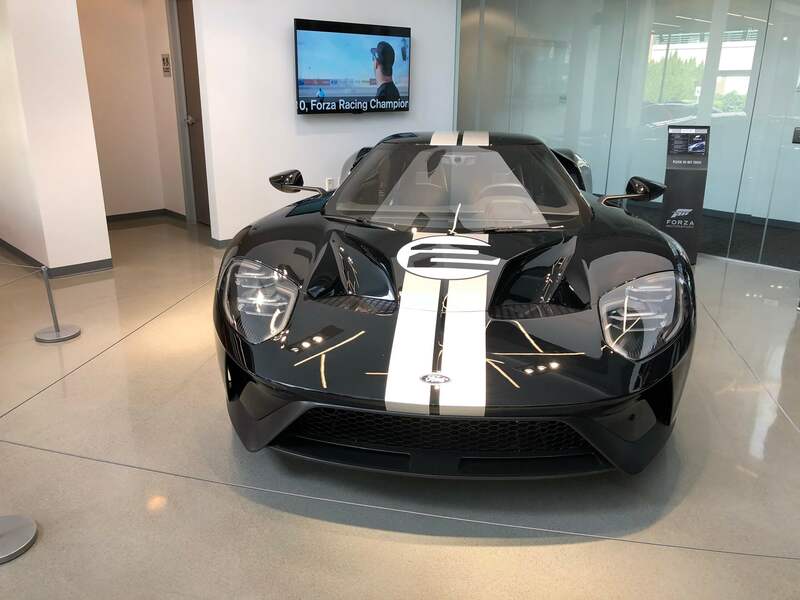 Once the tour had concluded and everyone made their way back onto the shuttle, Turn 10 Studio Head Alan Hartman asked if we’d like see to him start up his 2017 Ford GT. The number 2 in a white circle with adorning stripes is in homage to the Ford GT40’s unforgettable and historic performance at the 1966 24 Hours of Le Man. With that, we all rushed off the shuttle and headed back into the studio with our phones and cameras ready to hear what the Ford GT could do – and it sounded incredible. Hartman asked Aurélien ‘Laige’ Mallet of G2 Esports – the recently-established competitive racing team from McLaren’s F1 driver Fernando Alonso, if he wanted to sit inside the exotic supercar. After spending a few moments in the car, Laige swapped the driver’s seat with Alan so he could start up Ford’s latest V6-powered beast with its 3.5-liter EcoBoost engine and switch it into its dedicated 'track mode,' in which the Ford GT lowers its suspension as the rear wing prominently adjusts outwards. Check out the video of the 2017 Ford GT for yourself above and stay tuned for our upcoming exclusive coverage from the 2018 ForzaRC Pre-Season Invitational – including a deeper look at our tour of Turn 10 Studios and the overall experience of attending the event. If you missed it, the invitational saw F4H Motorsport take victory in the team events, whilst the individual races were won by G2 Laige, with Alien Motorsport’s RoadRunner and Virtual Drivers by TX3’s Lightning joining him on the podium as runners-up.